A week in Maui came at a perfect time as we had spent many days lately in the snow and freezing cold. I am one of those people that is severely affected by the cold and dark, S.A.D is very real for me, and after already having a month of dark during December, January can be a really tough month for me motivational and emotionally. On top of they were predicting the Armageddon of storms to hit the pacific northwest on the day we were supposed to fly out; tons of snow, ice, wind, and cold were headed our way. In fact the night before we were going to be flying out we got notice that our flight out of Portland, OR was canceled. This ended up working out for us as we were able to get on a flight that got us into Maui an hour earlier than anticipated. We arrived into Maui very late on Saturday night and with the two hour time change we were both very tired, but man stepping out into the warm air off the airplane was an instant blessing. 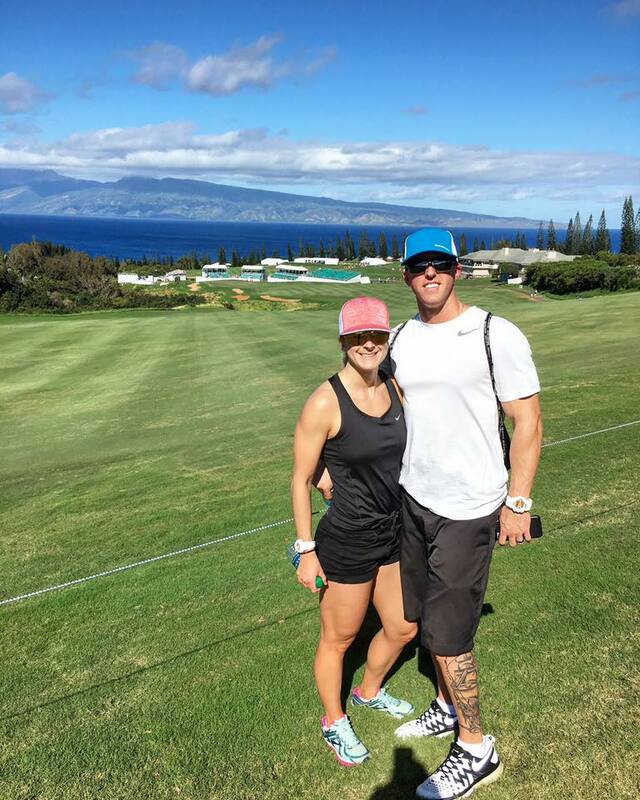 One of the main reasons for heading to Maui this year, besides escaping the cold, was to be able to go to the Tournament of Champions at the Kapalua Golf Course. This is a really cool golf tournament, if you are into golf it is the tournament to go to. Anyone who won a PGA tournament the year before, so 2016 for this one, was invited to the tournament. Its small, not many people go to watch, inexpensive, and hosts the best golfers of the year. The last day was on Sunday so that morning we went out to walk the golf course and watch the final day of the tournament. The Kapalua Golf course is beyond beautiful, it is carved into the hill side and over looks the ocean. Everything that we had heard about the tournament of champions was true, my husband and dad were in heaven. We literally were able to walk right next to a lot of the players, in fact at one point I was basically standing next to Dustin Johnson as he got into a golf cart. Due to the small crowds we were able to follow closely the players we wanted to follow, could hear them talking to their caddies and really get a feel for the game. It was a beautiful day for golf and a beautiful day to walk the course. If you are into golf I seriously recommend going to this tournament, it was a lot of fun. We quickly settled into a daily routine. Due to the time difference, 2 hours behind pacific time, we were up before the sun came up almost every day. That gave both my husband and I some slow time to drink our coffee and check emails at work in order to stay on top of things. Once the sun came up we would go down with my dad to get him a coffee and sit out front of the lobby to watch the sun finish coming up and listen to the ocean. One thing I had been really looking forward to was being able to run outside in the sunshine and warmth while in Maui. So I took full advantage of this, not only for the warmth but also to remind myself what it will be like in October for Kona. Each morning after our coffee I would head out into the sunshine for a sweaty, warm run. I was able to put some pretty solid miles in while I was there including a long run on Wednesday of 10 miles. It was warm but I love running in the heat, I love feeling the sun on my skin while I run. I also got a chance to do some ocean swimming. Swimming in the ocean is a different beast. I spend most of my time swimming in the pool or a lake in which there isn't much current that I have to deal with, or big waves for that matter either. I was pleasantly surprised to find that my times didn't change to much when compared to about what they were at Ironman Arizona however I did tire a lot quicker than when in a lake. It requires a lot more strength to swim in the ocean battling those currents. Any tips on how to improve your ability to swim in the ocean without being able to train in one?? Swimming in the ocean was a great confidence builder for me as there is something slightly terrifying about swimming in the ocean. Kona is still 9 months away so I may not even remember how it felt to do so but forcing myself to get about 6,000 yds total of swimming in while I was there built up some great confidence that I at least won't die while at Kona. Each day in the sun was finished with happy hour, either raspberry mojitos that I make (my specialty) or down at happy hour at the outdoor bar where Mai Tai's were 5 dollars. 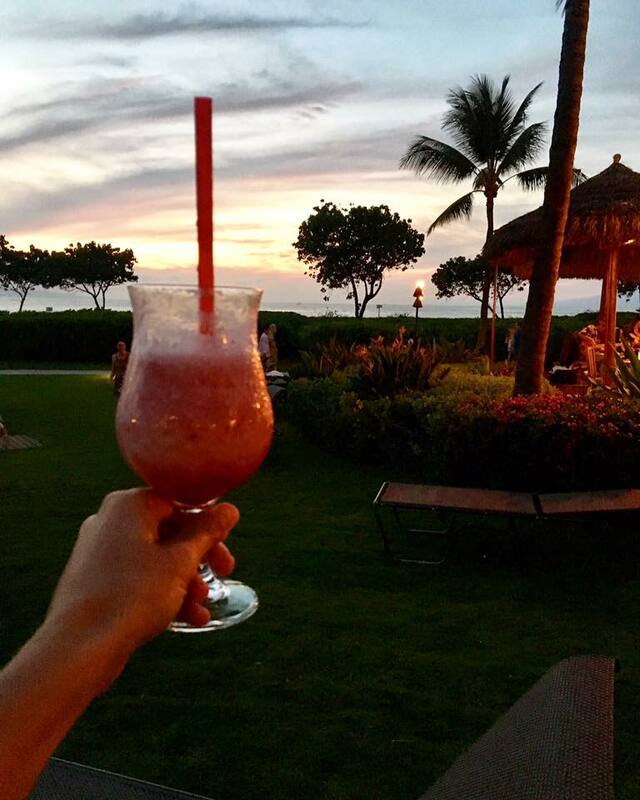 Its really hard to beat drinks outside while watching the sunset. Unfortunately due to work schedules it was a short trip to Maui, only from Saturday to Friday. Sometimes I am ready to come home from vacation, get back to the routine but this time I have struggled with coming home. I was not ready to leave the warmth especially knowing that I was coming home to really cold. The more I travel the more I realize that I that's what I want to be doing, I want to have the flexibility to travel more there are so many great memories that come with traveling. I think I've mentioned it before and if you know me personally you know that the cold and dark really cause me to struggle and I can honestly say that I have been a bit depressed since returning home. Struggling to get myself motivated to move forward with training, work, dealing with the cold, and knowing that I still have a bit to go until it is warm in the pacific northwest again. I ended up taking today (sunday) fully off to get my mind back in the game and so far it has been working, I woke up cranky and struggling and am finally beginning to feel better. On the road to vacation recovery! Despite my slight complaining that I have done the last two days since being home I have reminded myself that I just spent a week in Maui, a week in the sunshine, a week of running, swimming, drinks, being pool side, and spending time with my husband and dad. There is nothing I love more than any of those things, well except maybe having my mom and sister there to. Yes, the trip was not long enough but I still got the chance to go so that is much to be thankful for and that is what I will remember! What is your favorite part of vacation? What's your favorite place to go to just relax?